THE YEAR is 1962. Teenager Tracy and her friend Penny are watching The Corny Collins Show. When the chance to dance on the show arrives, Tracy quickly takes the opportunity. Not only do her dancing skills attract Corny Collins, but also the attention of teenage heart throb, Link Larkin. Less impressed is the show’s manager, Velma von Tussle, who will do anything to get Tracy off the show, even if it has to include Tracy’s parents and her new friends Seaweed and Motormouth. 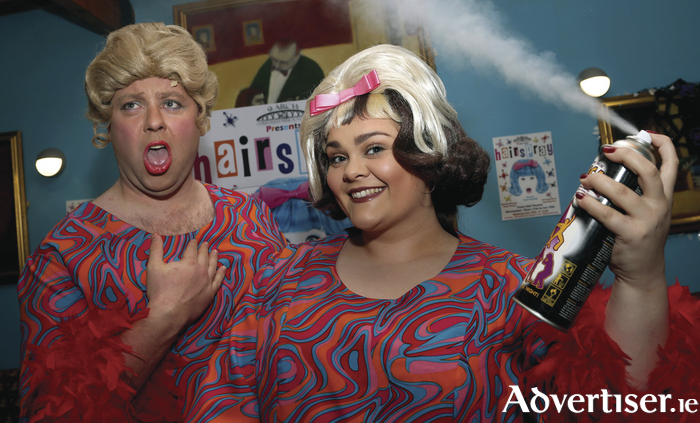 This is the hit Broadway musical Hairspray, which will be staged by Claregalway's 9 Arch Musical Society in the Town Hall Theatre from Thursday November 17 to Saturday 19 at 8pm, including a matinee on Saturday at 2.30pm. This is the 13th production by the 9 Arch Musical Society and will featuire a cast of almost 60, including Laura Charleton (Tracy ), Sarah Maguire (Little Inez ), Kevin Griffin, Cathal Ryan, Roisin Fowley, Suzanne Garvey, Heather Doyle, Rob Partridge, Emma Brady, Declan Gardiner, Conor Walsh, Michael Cooney, Karl O’Doherty, Janice Harnett, and Annette Cavanagh. Choreography is by Jay Molyneux. The musical director is Shane Farrell. The director is Peter Kennedy.